The Xiaomi Mi Note features a 5.7" Full HD IPS display, while its Pro sibling will flaunt QHD resolution on the same diagonal. The Mi Note's display has 386ppi, which is sharp enough never mind the 500ppi has already been crossed. The screen is protected by Corning Gorilla Glass 3 with curved 2.5D edges. 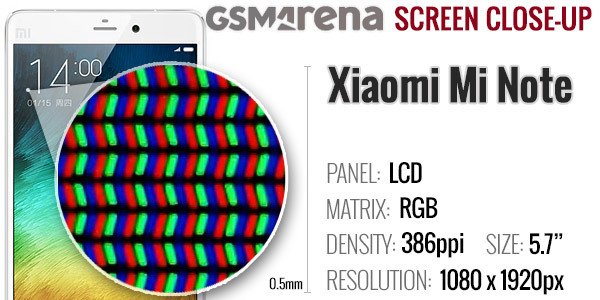 Taking a closer look reveals a standard RGB arrangement of the sub-pixels in the Xiaomi Mi Note LCD panel. The display on the Xiaomi Mi Note has a higher maximum brightness level compared to the Xiaomi Mi 4's, while retaining the same good contrast and colors. At 100% brightness the black luminance is among the lowest we've seen, while the whites are almost on par with the Mi 4's. 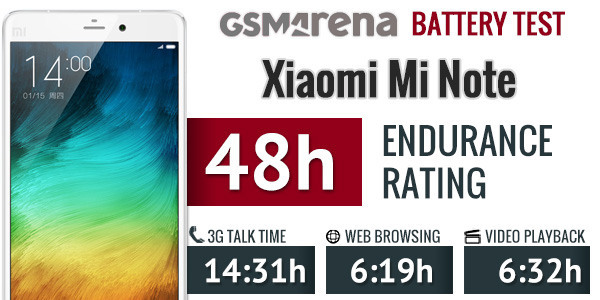 The Xiaomi Mi Note has a rather reflective screen, and the resulting sunlight contrast ratio is only average. Nevertheless, the 1080p display is reasonably legible in direct sunlight, even if doing so isn't the most comfortable experience. The high-sensitivity mode for use with gloves is available here much like on the Mi 4, but you probably shouldn't leave that turned on if you don't need it, because it's known to drain the battery faster. Finally, there is a way to prevent accidental screen unlocks, while the phone is in your pocket. If enabled, you won't be able to unlock the screen while something is covering the proximity sensor. Again, that would probably take its toll on the battery life. Speaking of, Xiaomi has put a 3,000mAh battery inside the Mi Note, a solid enough unit for a 5.7" device. We ran our battery test with one SIM and two SIM cards active. 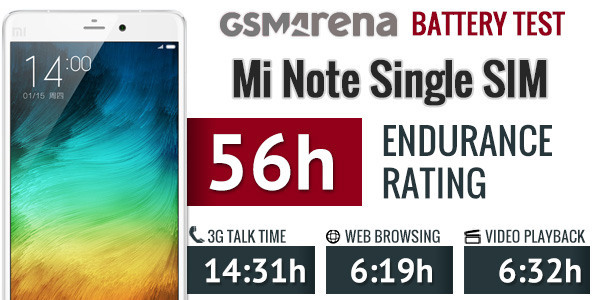 The single-SIM Xiaomi Mi Note scored a 56h rating, which means you can count 2 full days and then some if you do an hour each of calling, browsing the web and video playback a day. If you are to use two SIM cards, the standby time is halved and, along with it, the overall rating goes a little south to 48 hours. 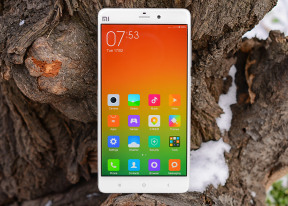 The Xiaomi Mi Note comes loaded with wireless connectivity features. There's Cat.4 LTE (up to 150Mpbs of download speeds, 50Mbps of upload), and there is regular 2G and 3G connectivity, of course. The Mi Note is a dual-SIM phone with dual standby. One of the cards can be connected to an LTE or 3G network, while the other will work on GSM only. Local connectivity includes (dual-band) Wi-Fi a/b/g/n/ac and Wi-Fi Hotspot capabilities. There is also support for Bluetooth 4.1 LE, but no ANT+ or NFC. The Mi Note relies on a standard microUSB 2.0 port for charging and wired data connectivity. What we do miss here is a wired TV-out option either via MHL or SlimPort. USB on-the-go and USB Hub are supported, which means you can external storage and peripherals. Finally, there is also support for GPS, GLONASS and BeiDou. Unfortunately there is no FM radio as the Snapdragon 801 doesn't come with FM support by default and Xiaomi didn't add it later either.